A well-known game for 2 players that encourages logical thinking. Ideal to use as a small group activity to encourage step by step logical thinking. 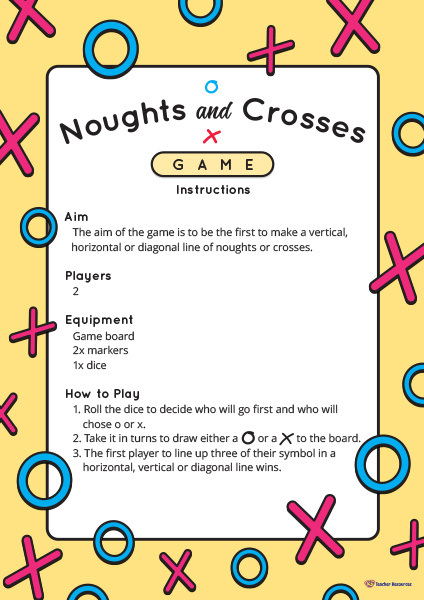 This resource includes an instruction card, two re-usable game boards and optional noughts and crosses counters. The children can either draw the noughts and crosses with a marker or use the counters. Select and download the required colour option. Print and laminate the instruction card and game board grids. Print, cut and laminate the noughts and crosses counters for children (optional). Provide a small group with markers and a board wipe. Model how to play the game. Ask the children to play the game with a partner.